Aaron Kintu Moses, an educator and leader of the Abayudaya Jewish community of Uganda, will share his work in a multimedia presentation at Syracuse University’s Hendricks Chapel on Tuesday, Nov. 1, at 7 p.m. The event is free and open to the public, and is generously sponsored in collaboration with Congregation Beth Sholom-Chevra Shas, Episcopal Campus Ministry, Interfaith Works of CNY, Plymouth Congregational Church, Trinity Episcopal Church and University United Methodist Church. The event is an opportunity for those attending to learn about interfaith programming around the globe and about faith communities working to transform the world. 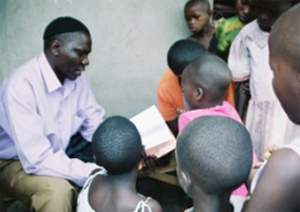 Kintu Moses has been the director of education of the Abayudaya primary and high schools since 2003. The schools educate and feed 700 Jewish, Muslim and Christian children studying together in peace. His presentation will include an overview of his work with the child nutrition project, public health education and women’s empowerment programs, and ongoing classroom, library, dormitory and other school construction; as well as the village microfinance, crafts, music CD, coffee and eco-tourism self-help projects. Kintu Moses will also share music from the Ugandan Jewish community.